This INCREDIBLE story, primarily about a secret tribe of natives that live deep in the copper canyons of Mexico, has absolutely transformed my summer. This book, about running, introduces us to these people that run like they don't know how to do anything else. I used to thing runners did the 42km marathon and that was it. I had no idea there was a thing called the ultra marathon where there are freaks that run over 100kms. It's nuts. 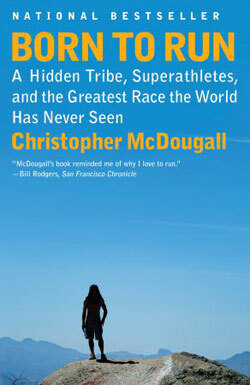 While revolving around the Tarahumara of Mexico, Born To Run is a book about running. The love of running. It goes off on tangents and covers many different aspects from running style, to injuries to anecdotes to cultural and political topics as well. But the central theme is the LOVE of running and how we are all meant to enjoy. A particular central figure, Caballo Blanco is an American dude that moved down to Mexico to become one of them. To join a people that wants nothing to do with the outside world. As I write this I feel like I just can't do this book justice and correctly brief you on everything about it. Needless to say, it's a fascinating read. You don't need to be any sort of fitness freak to enjoy it. It's a great story and as an added bonus it totally motivates you to run, it's crazy actually. I somehow managed to run the entire time I read the book but once I was done I ran 4 miles fresh off not having run for 6 months and only playing a bit of basketball sporadically. Now I've got the Nike+ sensor and the wristband that tracks my run and gives me data etc. I love it. I was born to run. So are you. Agreed! This book has a very compelling story. I teased my husband for "reading a book about running" then couldn't put it down. This is a great book for anyone. It's not just for runners.